Found this AC Relay in the local hardware for RM 12.00 that is about USD 4.00. 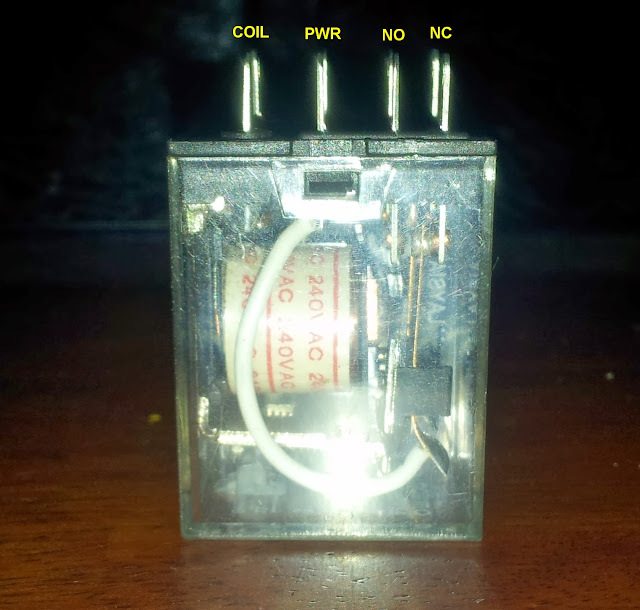 This relay operates off AC, the control coil is AC current activated. DC Relay is common but AC is a bit hard to get and not use that often. 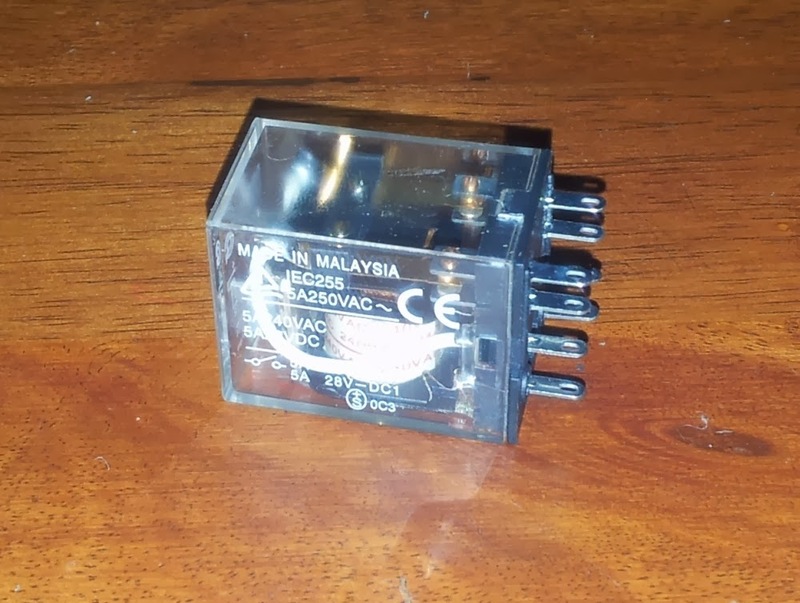 AC Relay has a special arrangement of "anti chattering" due to the continuously changing voltage polarity affect on the relay coil by having a slight gap between the coil core and the activating arm. This relay has a Double Pole Double Throw set of contacts, ideal to be use as a means of switching power source to two device alternately. If it is couple with a Photo Switch then we could have one device powered during the day and the other during the night. Actually that's what I intent to do, daytime the pump will be running and at night an aerator or alternate pump will run which could power my Bug Fountain. Relay pin out above, this can be easily incorporated into my existing Aquaponics power requirement. Simplified schematic above showing how I intent to wire it up for existing usage. Only thing missing from the diagram are "override" switch that may be needed to switches ON a device during its normally OFF condition for testing or just switching it ON during OFF time as mentioned. 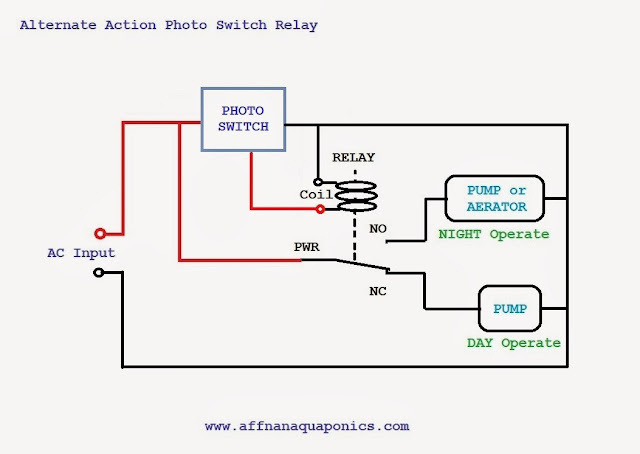 Another possible use of this relay in Aquaponics is to use it as a switch for back up power just in case the grid fail. 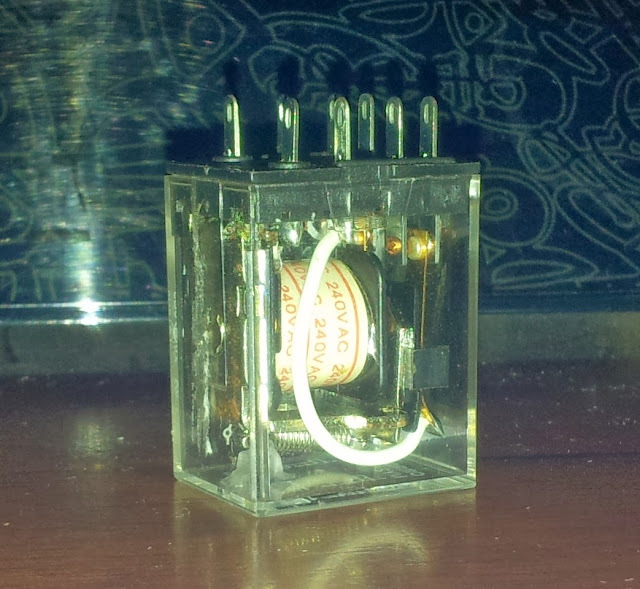 In this setup, the coil will be permanently wired up to grid power and bias the relay towards NO contact. If power failure occur relay relax and goes to NC where back up power supply could be waiting to kick in. Or it can also be use for switching between Solar or Grid power, but in this case it's best to use low voltage DC Relay which is more convenient and safe. Above diagram shows Single Pole Double Throw type, a Double Pole Double Throw just multiply the contacts by two and it could be use to switched the Neutral part of the circuit, or uses by another circuit altogether. Right, this is cheap and simple enough to do with minimum components, I will not need the Timer anymore if this one works good. Any idea how much is a photo switch ? I bought one for about USD 10.00 each. I used a digital timer for my pump and set the timer for how many hours On and Off. Yes I use that too for my Pump, and I use a photo switch for my aerator. 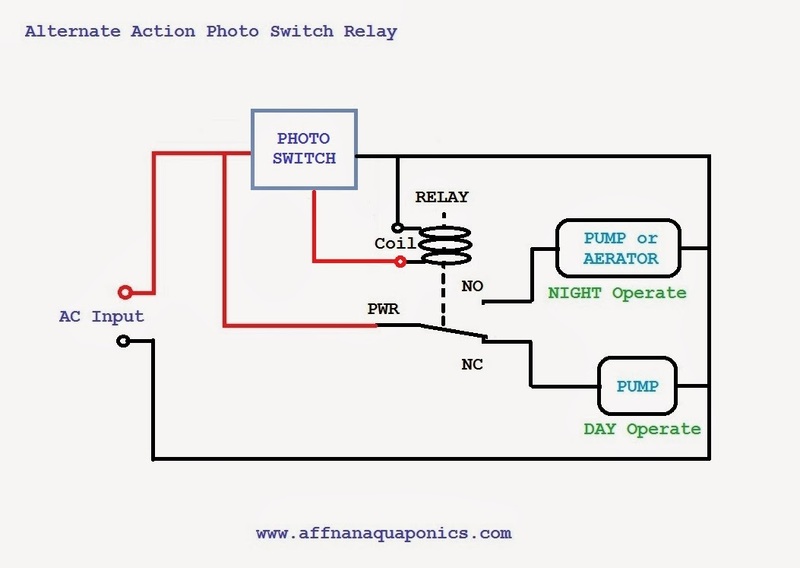 I want to simplified and minimize components by using this relay to alternate between pump and aerator using the photo switch. That's a good suggestion, so far I never test my setup except for PH. I thing what you suggest is something worthwhile doing. Need to get few of those test kit like Ammonia, Nitrite and Nitrate, looks like these are the area that I don't touch much.